← Wexford to race in a different direction in 2015 in a trial under the rules. 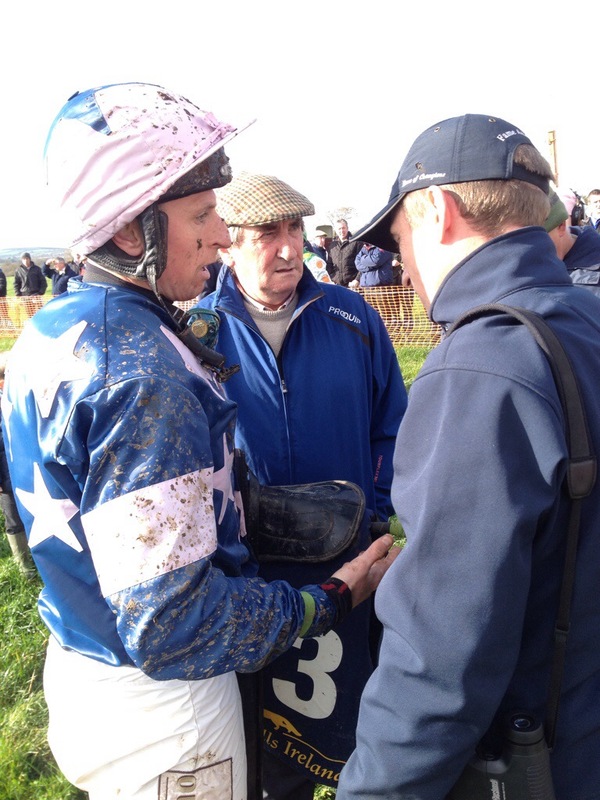 Codd Doubles up at Ballinaboola as new kid on the block Need To Know takes the Open. The Point to Point world is blessed to have access to a top quality venue like that at Moorfields, Ballinaboola in Co Wexford. With good road access, ample parking and good on track facilities the Wexford Foxhounds have been fortunate in securing the venue from willing local landowners. More importantly however in the greater scheme of things is the quality of the track with many well regarded “judges” continuing to give it positive reports. The local hunt staged their Autumn fixture at the track and with an entry of 107 and a declaration of 71 saw the customary six race card delivered. With the ground officially described as yielding those horses hoping for a bit of quicker ground might well have been disappointed. Heavy rain in the area on Thursday of last week obviously seeped into the ground with a dry sunny Saturday probably just making it a little on the dead side and undoubtedly more testing. The highlight of the afternoon had been billed as the clash of Vital Plot , Mossey Joe et al in the Ballywalter Farm sponsored Open Lightweight. John Brennan has never been afraid to challenge the bigger players over the years and he threw Need To Know into the mix with three other runners , seeing six horses face the starter. For the second time this season , Need To Know a Definite Article 6 year old lowered the colours of better fancied opponents and ran out a 3/1 winner from Vital Plot and Lord Heatfield. Liam Kennys ,Vital Plot and Enda Bolgers , Mossey Joe vied for favouritism with the Jamie Codd ridden Vital Plot just about shading it at even money and Mossey Joe at 6/4 under Brian Lenihan just before the off. In such a small field, Lenihan chose to set the pace on the Barry Connell owned 11 year old son of Moscow Society. Jumping pretty well most of the way Mossey Joe was followed by Vital Plot, Need To Know and the remainder from flag fall. Still to the forefront at the fourth last the giant chesnut gelding seemed to have taken the measure of Vital Plot who had fallen back to third as Barry O’Neill tried to drive Need To Know to pass Lenihan and Mossey Joe. From this vantage point, he was still travelling comfortably at this stage and looking likely to stay in front. With the field swinging into the home straight, the picture changed totally, Mossey Joe started to back peddle as Need To Know struck the front with a resurgent Vital Plot getting back on terms. This pair had a ding dong battle up the hill with a slightly wayward Need To Know staying on stoutly to win by 2 and a half lengths from Vital Plot with the only other finisher, Lord Heathfield staying on to be third. The decision to hold a stewards enquiry was no surprise nor the decision to allow the placings to remain unaltered. What of the two favourites? Vital Plot might not have been at home on the dead ground with three quick runs in succession, while Mossey Joe may have needed the run on his seasonal debut, but they will have to encounter Need To Know again and the new kid on the block might just have the legs of them! Racing opened with the Englishfruitnursery.ie 4 Year Old Maiden. This race saw 11 runners with the Mayglass based brothers William and Jamie winning with the Milan gelding For Instance in the colours of Jean Codd wife of the winning trainer William. This was a very open contest with five of them vying for favouritism early on at 2/1 in the betting ring. Brian Jordans Robinstown Bridge lead for most of the journey here under Mark Scallan and while only finishing fourth is one for the notebook. They were still in front three from home but gave way to the persistent challenges of Pawn Star and Inchiquin All Star. Jamie Codd however had been biding his time out the back on For Instance and while looking like needing the experience he accelerated to win snugly. Jamie Codd had a double on the day having also won the Nitrofert Wexford Hunt Cup for 5 Year Old and Older Mares on Queen Of Milan. 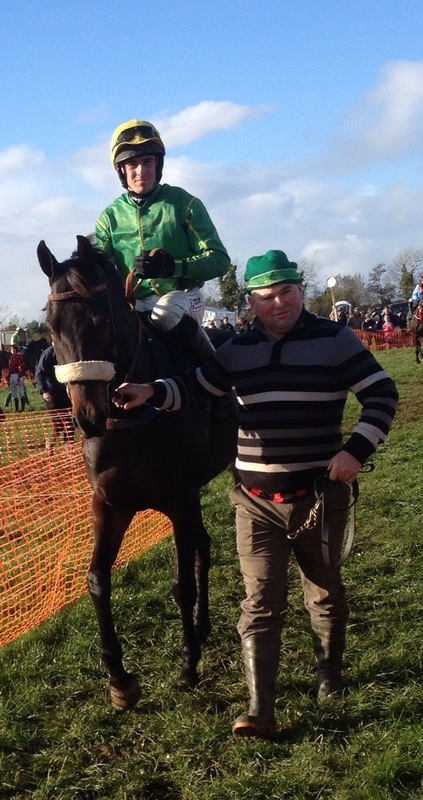 This 6 year old mare is not overly big but she gave her winning owner/ trainer Blackwater, Co Wexford based David O’Brien his very first success having taken over the reins in the Point to Point yard. Not winning out of turn , the mare has finished in the first four on all completed starts in the point to point fields, she was not far off the pace here and justified favouritism winning easily. Co Limerick based trainer Enda Bolger sent a team of horses to the Co Wexford venue and didn’t leave empty handed following the odds on favourite success of Rosstemple in the 5 Year Old Geldings Maiden. Racing in the colours of Co Limerick based John Power and ridden by his son Kevin, the 5 year old son of Kayf Tara held on to win by a length from Jamie Codd on Mullinavat. A 6 year old son of Witness Box named Subtitle won his maiden at the January 2012 fixture here under Kiltrea native JJ Slevin, and the same horse and jockey combination popped up to win again , this time the Cooney Furlong Winners of Two. The story of this race is very simple, Slevin popped the horse off in the front and having opened up a long lead no one could reel him back in. Slevin obviously judged the pace very well but the other 6 runners looked like they might well have been too busy looking at each other and forgot about the leader! The most local winner of the day saw the Horse and Hound Hotel sponsored Older Geldings Maiden being won by Corrigs, trained and ridden by Eddie Keating. Keating trains 3 horses for Michael and Tom Corcoran in Nash, New Ross and this home bred son of the Knockhouse Stud stallion, Millenary took this race impressively. With 18 runners they were well strung out three fences from home with Cango making the best of his way home with the well fancied Court Frontier running on. Keating however knows his horse well as they swept past all comers to win easily. The exact same connections took this race last year with Subtle Ben, who was sold on to Liz Doyle and has won on the track since. “This horse has some track experience and he might go back that way ” according to Keating.